Video startup Remixation is updating its Showyou app this week with new catch-up features and a web component. 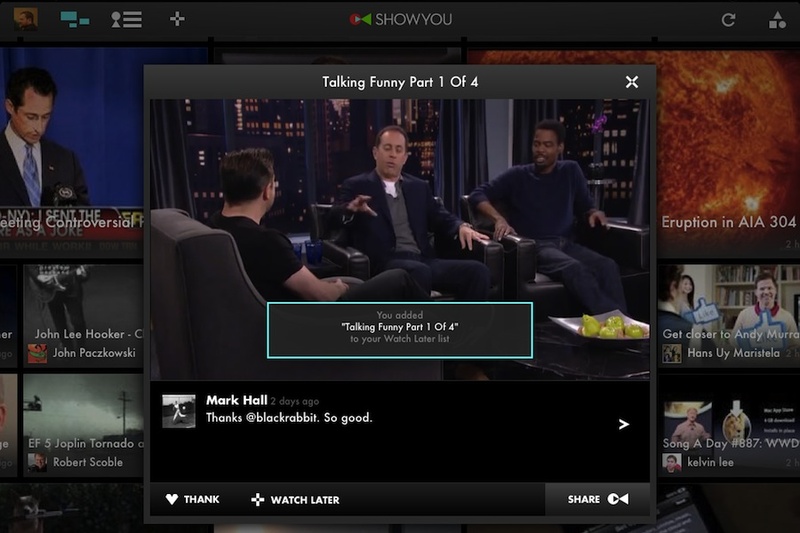 Showyou’s iPad and iPhone apps were launched earlier this year to improve the discovery of videos through social networks like Twitter and Facebook. With its distinctive video wall, Showyou focused specifically on adding a visual aspect to quickly browsing through videos from multiple sources. Now the app is adding new features to make it easier for its users to catch up on videos that their friends have shared. In particular, Showyou has added a “watch later” option that will let viewers save videos of interest until they’re actually able to watch them. In particular, “watch later” could become a killer feature for the iPhone app, which many users turn to during their commutes or other downtime, when they might want to scan videos but don’t necessarily have time or bandwidth to stream them. In conjunction, Showyou is also launching a web destination at Showyou.com, providing all the same functionality as its mobile apps. On the Showyou website, users can check their feeds or catch up on videos that they chose to watch later. They can also “thank” connections for sharing videos in Showyou or comment on them. The Showyou.com site was built in HTML5, providing support on modern web browsers. By using HTML5, Showyou could have the flexibility to reach a number of connected devices. The Boxee Box, Google TV (s GOOG) products and the Sony PlayStation 3 (s SNE), for instance, all have browsers that should support the site. There’s just one catch: The Showyou.com website is only for users that have already downloaded and used the mobile apps. Which means you can’t just sign up in the browser; your login will only work if it’s already been validated through one of Showyou’s mobile applications. Finally, the startup is rolling out a Showyou bookmarklet to simplify the sharing of videos discovered while browsing the web. Showyou is just one product from Remixation; Remixation is also behind the video curation site Vodpod, which offers a similar bookmarklet. Altogether the new features are designed to extend the platform beyond just the iOS mobile apps that it is available on now. According to Remixation CEO Mark Hall, the nice thing about building its web property in HTML5 is that it’s a cheap and easy way to experiment on new platforms. While connected TVs are of interest, the next stop will be building an Android mobile app.